TORONTO, June 6—When the first person to win a provincial medal in the 200 metres for Frontenac Secondary School found herself standing near the latest person to win one, she couldn’t resist. Cheryl Thibedeau had to meet Cole Horsman. “When I found out I was giving out medals, I said, ‘Could I please do the midget boys,” Thibedeau said after the medal ceremony on the final day of the Ontario Federation of School Athletic Associations track and field championships. Alas, it wasn’t going to be quite that poetic. Thibedeau presented the medals to those who won them in the girls divisions; Tony Sharpe, the Olympic relay medal-winning former teammate of Thibedeau, had that honour for the boys. Just the same, Thibedeau, who won junior girls 200-metresn gold for Frontenac in 1982, had to meet Horsman, the midget runner who won bronze in the same race today. Thibedeau had been following Horsman's season closely. “I knew he was coming,” she said. When he got here, there was no question about making the connection. When they both found themselves standing in the infield of the track—he waiting to recieve his medal, she waiting to present some—the opportunity was there. “I’m always a Falcon,” said Thibedeau, who moved to Toronto for her final high school years to train with sprint guru Charlie Francis. 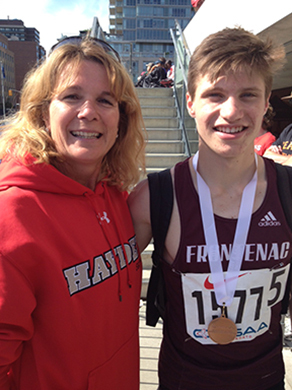 In all, she won seven OFSAA medals for Frontenac and C.W. Jefferys before embarking on a career in which she would win a medal in Pan Am junior competition and serve as a relay alternate on Canada’s Olympic team in 1988. Horsman said he was glad she took the opportunity to introduce herself. “It was cool to see someone there that was from Frontenac,” he said. Thibedeau, a personal trainer the last 21 years, is married with three children, the youngest of whom, Kenna Hopkins, was a member of a girls 1,600-metre relay team here representing Dr. Frank Hayden Secondary School in Burlington, where Thibedeau coaches. Another son, Ryan, was a gold medalist last year with a relay team from Burlington Nelson. Thibedeau sees great potential in Horsman. She encouraged him to seek the guidance of Wayne Bulak of the Kingston Track and Field Club, who just so happened to be Thibedeau’s coach in Kingston. Horsman, however, wasn’t quite feeling the strength after his race. “I had a good start,” he said. “I had the lead at the corner and they just pulled ahead of me. Disappointed with finishing third, Horsman could console himself with the knowledge that twice—first in the morning heat, and again in the final—he established a new personal-best time, ultimately leaving the Varsity Centre with a time of 22.84 seconds, an improvement over the season of 44 one-hundredths of a second. The thought led him to be a little less hard on himself for not winning a 200-metres race for the first time this year. “You have to see where you’re at and where you can improve,” he said. “I’ll just enjoy the moment, the experience, the great achievements that I got. It was fun. Emmanuelle Ajiroba of Brampton St. Augustine, the same boy who edged Horsman in a photo finish in the 100 metres final Friday, won today’s race in 22.68 seconds. Justin Mensah of Toronto Chaminade, who was third Friday, was second in 22.75 seconds. All three runners improved their performance dramatically from the previous week. Mensah posted a time of 23.24 seconds in his regional meet, while Ajiroba qualified in 23-flat. Horsman went into the event with the best regional time, 22.99 seconds. For Ajiroba, it was actually the third medal of the meet. He won the bronze in midget boys shot put. For Horsman, it was the rarest of all medals. The 200 metres is the event in which the fewest medals have been won by Kingston Area athletes. Thibedeau was the first, and in the ensuing 33 years, only Taryn Turnbull of Frontenac (midget girls, 1993), Dan Brandao of Bayridge (midget, 1999) and Wade Embury of Sydenham (senior, 2013) have medalled at that distance.